Don’t worry, Larry; we’re not going to talk about adjusted plus-minus…too much. A few days ago, Larry Brown declared that for basketball, advanced stats “don’t work”. But when you read what he has to say, you get the sense that Brown thinks that some advanced stats don’t work. In other words, I think there are some “advanced stats” that Brown might like. What explains wins in the NBA for Brown? Rebounds, shooting efficiency, and defense. Brown often talks about “playing the right way”; it appears that much of Brown’s “playing the right way” is captured in Oliver’s Four Factors and in Wins Produced. So Brown should agree with some advanced stats. Of course, in the article Brown doesn’t say which “advanced stats” he was shown, but my sense is that he was being shown something other than the Four Factors or Wins Produced. What might he have been shown instead? We had a guy a few years ago that was sending me emails about different lineup combinations, and he was saying, ‘this lineup should be on the court a lot more because they’re the most effective.’ So, then you coach that lineup and keep them on the floor for 40 minutes. I’m going to stay with the lineups that I have on the floor. Or perhaps Brown was shown plus-minus analysis, which is supposed to show the impact of individuals on team outcomes (even if it doesn’t work very well). But lineup and plus-minus analysis are “black box” stats — they aren’t very useful for decision-making because they don’t tell a coach why a certain player is “good” or “bad”. Going back to the Hollins quote, Hollins also sung the praises of Rudy Gay, who Memphis traded away to the Toronto Raptors about twenty days later. Given the success of the Grizzlies since that trade — something that we expected, even though it was contrary to popular opinion at the time — it’s clear that Hollins was incorrect in his assessment of Gay. Could better stats have led Hollins to see this before the trade? But presenting a “black box” stat – such as line-up analysis or plus-minus – is simply not going to convince someone not trained in stats (of course it shouldn’t convince someone who is trained in stats either!). A better approach would be to try to explain why teams win games. Again, coaches seem to know that teams win because of rebounds, turnovers, and shooting efficiency. Showing that Gay doesn’t help a team in these areas might have convinced Hollins that all would be okay if Gay left town. And the same approach might also work with Brown. Again, Brown already knows why his teams are good or bad. If he was shown stats that allowed him to connect what he knows about winning basketball teams to individual players, he might be more enthusiastic about “advanced stats”. 27 Responses to "Larry Brown probably likes some Advanced Stats; he just hasn’t met them yet"
I agree, Hollinger did well trading Gay. She ended up trying some of mine and commented it was very good. She explained the dish she’d had before was bad. In short, like Larry Brown, my mother equated all dishes with the name the same and did not consider that who was preparing it and how it was made mattered. Your anti-plus/minus view has always confused me. Teams win games by outscoring the opponent, which is what plus/minus captures. Also, it’s been shown multiple times that RAPM is faaaar more predictive than WP (and all other box score stats). The Eli Witus study was discussed when it appeared years ago. I also use it as an example in my stats-based courses of how NOT to do regression analysis. A coach can’t go to a player, and tell him to increase his +/- to win games. The players will ask, “how am I supposed to do that?”. The coach will have no answer. Clearly you need to outscore the opponent, but +/- gives you no indication of how you might go about it. A coach can ask a player to increase his WP to win games, and there’s a known formula to do so. Rebound the basketball (especially offensive), don’t turn the ball over, and shoot efficiently. Do those things, and you’ll win most of your games. The predictive capabilities of RAPM are neither here nor there, as far as this discussion is concerned. I have criticized Hoopdon’s comments in the past. But that was a good response! I would add, I do not think RAPM can actually explain current wins very well. At least, I recall reading that in the past. Not sure what it means if you say you can predict the future but can’t explain what you are currently seeing. Essentially, that would mean you are saying “not sure what that missed shot means with respect to the game you are watching, but next year that missed shot means this”. It seems to me that prediction and explanation are indeed subtly different things. Baseball analogies are the easiest in that regard. Two batters with the exact same number of PAs and the same BA/OPB/SLG can have a very different impact on runs (and wins) depending on their mostly random circumstances and performance. In terms of explaining wins, the player with the better circumstances with have had more of an impact. In terms of prediction, they should be exactly same. 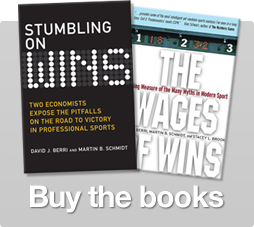 Thus, a metric derived for prediction won’t explain wins nearly as well as one designed for prediction. I really enjoy the commentary here, but I’ve never really understood the blase attitude toward prediction. Explanation is interesting, but it doesn’t seem to attempt to tease out the true value of the players from the randomness of an NBA game. At least for me, finding that true value in terms of prediction should be the number one goal of any metric. I guess this is somewhere I will just agree to disagree. They have trouble understanding that a made field is worth 0.033 wins or whatever, and that this was found via regression analysis. If anything, WP-style stats are the black box. All the players’ numbers go in and a complete, single number rating comes out. How that is found seems a lot more mysterious and confusing. Saying x 5-player combination allows fewer points than y 5-player combination is a lot easier to understand than a lengthy linear weights formula. Coaches understand all the stats that go into WP. What throws them off is how the final number is arrived at. Keep in mind, I’m not critiquing WP (I can do that some other time). Coaches *should* be able to understand it. But quite simply, plus/minus and lineup data is easier to understand. > A coach can ask a player to increase his WP to win games, and there’s a known formula to do so. > things, and you’ll win most of your games. So, in a tense moment, late in a tight game, the coach calls the team together and says, “Get more rebounds! Stop missing!” (I’ve never played competitive basketball, but they tell me this sort of thing really happens.) I’m not sure that’s really any more actionable than ‘improve your plus minus’. I think this post did a good job of showing that coaches DO intuitively understand WP (Turnovers, Rebounding, Shooting), they just call it by those terms, and not WP. They tell there team, don’t turn it over, rebound, and shoot well. They are basically saying, “lets go get a high WP score”. They understand how to use the kitchen to make a meal, they just don’t know the name of the meal when its ready. But its tasty, and people love it. Lineup data is useful in that you know when you are playing a great squad together, but you don’t know why they are good. It seems that in a playoff series, when matching up and making adjustments, not knowing WHAT makes a good lineup, would be pretty detrimental. They don’t know how to cook. They know that if they push a button, Pizza comes out of the oven, and its tasty. But what if a customer wants Chicken, or Steak? No amount of button pushing will make those items. On a last note, the only study I know of that compared different metrics predictability, had Win Shares > RAPM, with RAPM SLIGHTLY outdoing WP (2.67 to 2.66). If you know of others, I’m always interested. If you watch Coaches Corner, here are some of the concepts they float during huddles, which are very WP oriented, and fairly actionable. I suspect a +/- huddle would go something like this. “Well guys, this is our most productive lineup, and we’re losing…so….”. Neither is perfect, but its fairly clear which is more actionable. ^None of this is knew information, or at least, it shouldn’t be. I’m pretty sure coaches know that open shots are good, rebounding helps you win games, etc. So WP isn’t actually too helpful to coaches. Meanwhile, as a GM, if I was given the choice of one of two models as my basis for decision making, I don’t think I would go with what has the most backward looking explanatory power; I would choose what has the most forward looking predictive power. As for the link I posted, I know that Eli Whitis’s study was dismissed by this circle, but this is a new, much more thorough study. Whitis had less than one season of data, while this one has 5 full seasons. 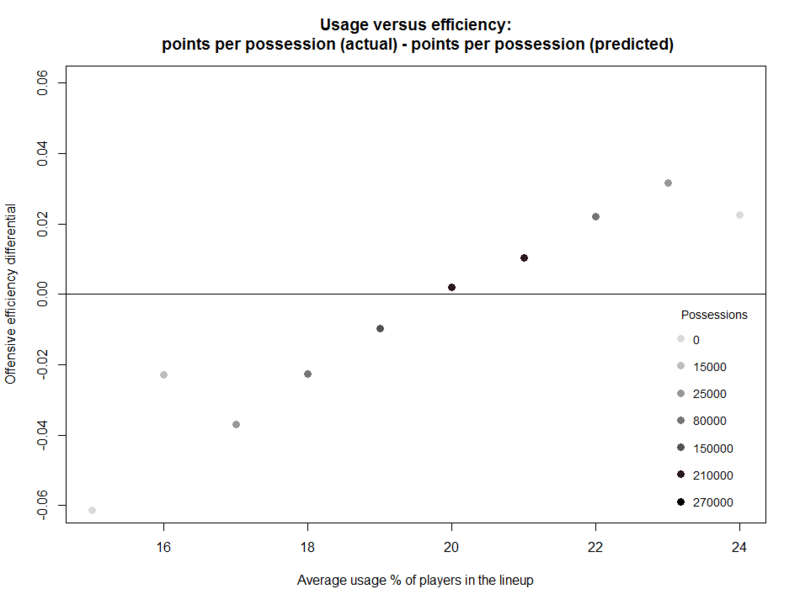 (For reference the article is here:http://ascreamingcomesacrossthecourt.blogrspot.com/2013/05/usage-versus-efficiency.html) This should serve to mitigate at least some of the complaints about the previous study. 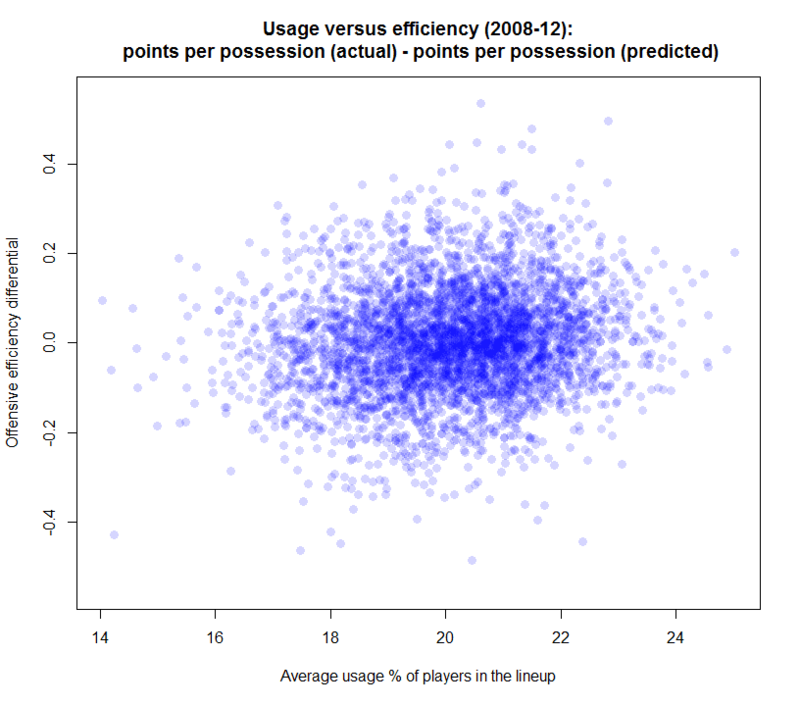 So we do seem to have some decent evidence that high usage players do help improve a team’s offensive efficiency. Meanwhile, I don’t think I’ve seen any evidence whatsoever that shot creation does not matter, or any evidence suggesting that low usage players would play as well around other low usage players as they would play around high usage scorers. All the ingredients going in a getting one “food” out is what makes it, by definition, a black box. Coaches do understand the ingredients, but for whatever reason they don’t trust how the final number is arrived at. And how does WP tell a coach that he should adjust his team to crash the offensive glass harder? It doesn’t, because WP is one number, just like plus/minus. And offensive rebounding increases both plus/minus and WP, but neither gives insight as to why that particular component of the game should be focused on. As for RAPM/WP, here’s a study http://apbr.org/metrics/viewtopic.php?f=2&t=8196&start=15. RAPM, WS/48, ASPM, and in later years even PER are more predictive than WP. Just to clarify. The reason the term “black box” is used is that the box is opaque, meaning you can’t look into what is going on. Having a “single number” does not make something blackbox. You can go to thenbageek.com and see exactly why a player is classified as good or not using Wins Produced. IF players understand all the numbers that go into WP and get upset at the output, I’d argue they don’t really understand the output. Key phrase from your link “update of the Rosenbaum study”. The study was never published, but it was refuted more than once in published work. You need to go read why this study wasn’t any good. As for the Witus stuff… doing it across 5 years doesn’t solve the problem with the study. I think all this gets at a key problem in the APBR forum. Many of the people in this forum do not know how to conduct — or evaluate — research. Essentially this group does a study, I and others point out the problems, the forum ignores the critiques and re-does the same study a few years later. Are we supposed to refute the same study again? When does this game end exactly? You say that, if you were a GM, you would go with “what has the most forward predictive power”. Given your earlier comments, I presume that means you would favour RAPM or some other +/- variant? So, if you were to…oh, I don’t know, try to predict the future for some sort of NBA playoff contest…would you use some sort of +/- to make your selections? If you were asked to predict how that would go, what would be your prognostication? Of course, the playoffs are a bunch of small sample sizes, and I recently read about how those can sometimes be deceiving…. I must agree with everyone in applauding your comments; the cooking metaphor was particularly inspired. If we had a page for hall of fame comments, that one would be there! I’m not sure how exactly you determined that I use or favor RAPM. I simply said that I would prefer a model that would allow me to predict the future rather than one that would allow me to explain the past. Obviously being able to do both would be ideal, but if you had to choose, I would like to maximize the forward looking abilities of the model I use. Wouldn’t you agree? In any case, if you were trying to make a jibe at my playoff contest scores, I didn’t use a RAPM driven model or any other statistical model to make my picks. I just used my gut, which explains my likely horrible score haha. “As for the Witus stuff… doing it across 5 years doesn’t solve the problem with the study. Thanks! That was my update to the study. I would like to hear these critiques. You may disagree, but in March he posted that study. In June he left the blog because he was hired by a team. Terrible basketball numbers guy, huh? Kinda seems like a pattern, no? I want to look at how efficiency changes with specific players and maybe add some more advanced techniques. Can you post that study? Because the ones I saw said the opposite. Year one is the next year, year two is two seasons from when the stat was taken, etc. By the way, while talking about regression analysis and prediction methods, when we talk about Wins Produced explaining wins we cannot use in-sample results. You need to test the metric out of sample, meaning predicting team wins in the future season without the benefit of using the stats from the season, prediction wins with new lineups or team changes. Also, speaking of regression analysis, Wins Produced found the marginal value of box score stats, but you cannot assume that value belongs to the respective player. It’s a team game with interaction. The player who gets the rebound — the credit goes to the rebounder or the guy who forced a tougher shot? Really hard to quantify that. When you teach basic regression, do you discuss the problems there? I am not going to endlessly repeat the same critiques over and over again just because someone does the same study with new data. But you are free to look these up in this forum, in Stumbling on Wins, and in my published articles. If you need help finding this stuff, send me an email (berri@suu.edu). the two surprise teams…. houston and memphis both use analytic , but somehow they are useless?! Im proud of hollinger, he is making us look like we arent a bunch of geeks making implausable theories and that know nothing baout the sport. I have no ability to prove this, but I think an analysis of line up combinations almost has to have some added value if it’s done well. The problem is sample size. But even with small samples you might be able to learn something. As an extreme case, few would argue that a lineup of all PGs or all Cs would not work well even if they were all value added players. A line up of Prigioni, Kidd, Chandler, Martin, & Shumpert probably would not work very well either even though they would all be playing at reasonable positions (can’t score). Part of the process is finding the proper balance of skill sets that maximize the offense, defense, and diminish diminishing returns. You can see a lot of that stuff in the box score (this lineup doesn’t have enough rebounding or scoring or playmaking, etc…), but I think it’s hard to measure some of the fine line interactions of players with different skills so that everyone is being as productive as possible. Coaches tend to do it by watching the games and simply sticking with what’s working well (trial and error), but if that could be measured well, it would have to help. > able to learn something. You don’t actually need to do analysis on specific line-ups to do combination analysis. You could make a taxonomy of players by height and weight, or anything else like Dwight Lutz’s 10 categories, and then analyze line ups modulo that taxonomy. We can think of it as a more formal version of the ‘Karl Watch’ commentary if you like. > though they would all be playing at reasonable positions (can’t score). This is the basic usage/efficiency and shot creation debate. Novak is a very efficient scorer, but the only thing he can do well is spot up 3s. He can't drive, shoot off the dribble, draw fouls etc.. well. That's why his usage is so low. Tyson Chandler is a very efficient scorer, but the only thing he can do well is dunk alley oops and get put backs. That's why his usage is so low. Kenyon Martin is very limited to around the basket etc.. Anyone can take a lot of shots, but when a line up is stacked with very limited offensive players they are easier to defend and force outside their comfort zone. So their efficiency falls. When it's limited to one player, there is usually enough versatility among the remainder to easily make up for his offensive limitation without much if any loss of efficiency to the team. If it was 3 or 4, you'd have a major problem. That's why coaches never send lineups like that out on the court. Some would argue it's noticeable at 2, but IMO it depends on how skilled the other 3 are.